Boxing is far and away my favorite cinematic sport. The three types of dramatic struggles are contained within the ring - man against man most obviously, and man is constantly fighting his own limitations within a less than forgiving environment. Particularly, the further back you go in history, rings would often have the blood of the last fight on them, and even if the crowd is in your favor, nine out of ten of them would be just as fine seeing you clobbered. 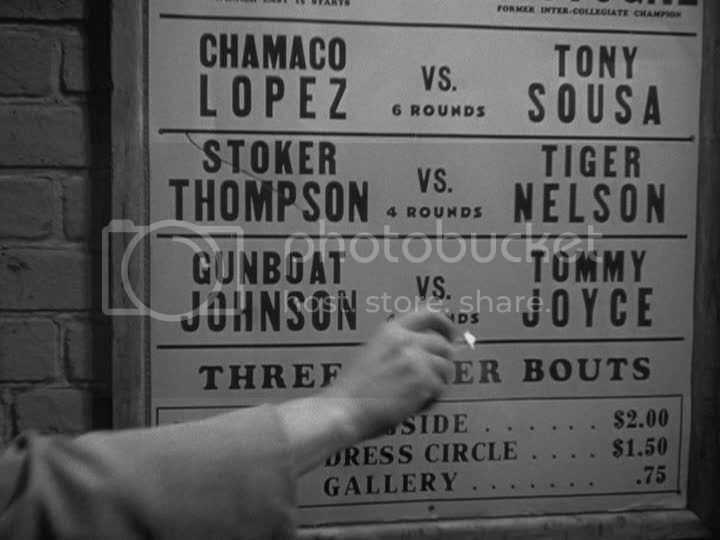 Most of all, it takes a whole other kind of mindset to step into the ring time after time, and that's certainly the position in which we find Stoker Thompson (Robert Ryan) as Robert Wise's masterpiece opens. Already in his mid-30s, Stoker is considered an old man, washed up, and he's set to fight a kid in his early 20s that very night. The only thing keeping him going - his wife Julie (Audrey Totter) - can't even bear to watch him fight anymore. The film unfolds in real time over a scant seventy-two minutes, much of it spent in the milieu of the boxing world, all of it captivating. Wise reportedly spent a good deal of time soaking in the real-world environment, and to this writer's uneducated eye, it feels like the best kind of movie real. Gritty without laying it on, establishing a rapport amongst the characters that is just a smidge beyond believability. Wise's direction on the whole is masterful, from iconic shots in empty hallways to a breathtaking boxing match that had me on the edge of my seat - rarely have I been so uncertain of the outcome. The film also sidesteps the least compelling aspect of many a boxing picture - the mob. When given the choice between going along with a mob order to take the fall or to stand up against them and fight the good fight, we're left either way with a dramatically weak set-up (you'll pardon the pun). Either the guy is too righteous, or too soft. In this picture, we learn pretty quickly that Stoker's manager has taken mob money on the promise Stoker will take the fall, but he's so certain Stoker will go down, he figures there's no reason to tell him. That's the kind of Hitchcockian suspense you never see in this kind of picture, and it adds just the right twist of the screwdriver to the proceedings. It's a great film; I'd go so far as to say a perfect one, with so many surprises still in store for you. It's available on DVD as part of a quite impressive box set.